George Frideric Handel was a German born composer (original spelling "Georg Friedrich Händel") who moved to Britain and settled there, becoming closely associated with British baroque music and in particular the music he composed for the British morarchy. At an early age Handel showed a strong interest and aptitude for music, although his father had wanted the young George to study law. Georg senior reluctantly allowed his son to attend music lessons and young Georg quickly became a skilled violinist, organist and harpsichordist with a solid understanding of music theory and composition. Although he started to study law as per his father's wishes, the teenage boy spent increasing amounts of time of musical activities, meeting and attracting the attention of eminent musicians and composers of the day. Although the composers never met and had little in common stylistically, Handel was a contemorary of Johann Sebastian Bach (and also of Domenico Scarlatti, since all three composers were born in the same year). In many ways Handel was better known than Bach at the time, and the young Handel's playing drew the attention of established composers of the day such as Georg Philipp Telemann and Royalty such as Frederick I of Prussia. Handel spent several years in Italy where he became familiar with the traditions of Italian opera, and studied the music of famous Italian composers such as Corelli and Alessandro Scarlatti. Scarlatti's son Domenico was a celebrated keyboard player, and it is said that Handel and Domenico took part in a keyboard duel. The outcome was that the young Scarlatti was said to be the better harpsichordist and Handel the better organist. In one of those curious twists of fate, Handel became "Kapellmeister" in 1710 to George, the Elector of Hanover (Prince of the region now part of German). 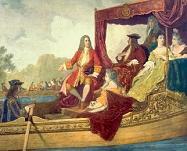 Then the composer moved permanently to England in 1712 working among others for Queen Anne. When Queen Anne (the last of the Stuarts) died in 1714, it was her cousin George from Germany who became George I of Britain (the first Hanoverian King). So Handel ended up working for the same man in a different country. One of Handel's best known works, the Water Music from 1717, was composed to entertain the King and his guests on various occasions as the Royal party of barges journeyed on the Thames. 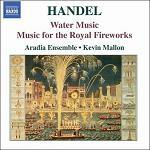 It is royal commissions such as his "Water Music" and "Music for the Royal Fireworks", still very popular today at concerts and events today, which more than any others have associated Handel with British music traditions, and a worthy successor to Henry Purcell. When George I died in 1727 he was succeeded by his son George II. 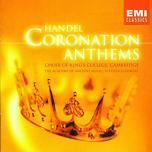 For the coronation of George II Handel (who by this time had become a British citizen) composed four anthems. The first of these is the famous "Zadok the Priest" which has been sung at most if not all British coronations since that time. It was much later in 1749 that Handel composed his "Music for the Royal Fireworks" (this time for George II) to celebrate the Peace Treaty of Aix-la-Chapelle which marked the end of the War of the Austrian Succession, which had involved many Kingdoms and Empires across Europe. Among other orchestral music, Handel wrote 12 Concerti Grossi and several Concertos. Although less well-known, Handel also composed many chamber works including several Keyboard Suites and Sonatas for various instruments. 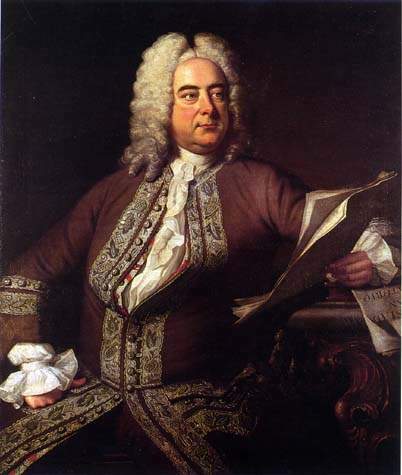 Handel adopted the style of opera known as "opera seria" which he studied while in Italy. 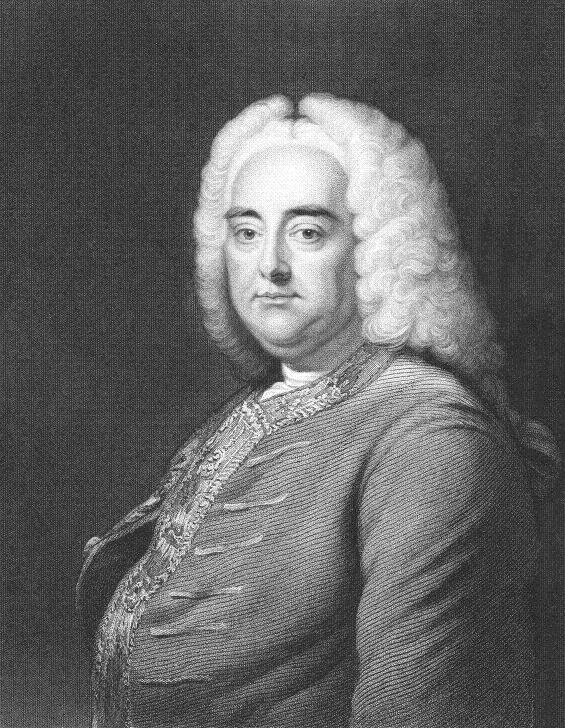 This is quite a formal style of opera, but Handel gave the form an added dramatic dimension and had a reasonable degree of success with many of his operas such as Xerxes which opens with the aria "Ombra mai fu" for soprano and strings, though generally known by the name "Handel's Largo" in instrumental arrangements. In many ways this reflects the position of Handel's operas today - their length and formal structure does not connect well with today's opera-going public, though individual songs are regulary performed and regorded outside their original operatic setting. In Handel's day these "serious operas" also went out of favour with the public for similar reasons and with the added success of John Gay's "Beggar's Opera" which satirised the pomposity of opera seria. Within a few years Handel had hit upon a solution to opera's declining fortunes - the Oratorio, a form which had matured in Italy parallel with Opera but generally at that time reserved for religious topics. Handel had experimented with Oratorio as a young man in Italy, but his first mature successes with the form came with "Saul" and "Israel in Egypt" both composed in 1739. The first performance of the "Messiah" was given just 3 years later in Dublin. This was followed by performances in London later that year, and Handel's Messiah quickly became established as a favourite with audiences. Given its subject matter "Messiah" is often performed during the Christmas Season or at Easter. Although not quite capturing the status of the "Messiah" Handel went on to compose several other oratorios including Solomon which containt the popular work "The Arrival of the Queen of Sheba". Opera: Rinaldo - with the aria "Cara sposa, amante cara"
Opera: Rodelinda - with the song "Dove Sei" or "Art Thou Troubled?" Oratorio: Messiah - possibly the best known oratorio ever with its "Hallelujah Chorus" and the songs "I Know that my Redeemer Liveth" and "Unto Us a Child is Born"
Oratorio: Semele - which contains "Where'er you Walk"
Oratorio: Judas Maccabaeus - with the rousing the chorus "See, the Conquering Hero Comes"
Oratorio: Solomon - which contains "The Arrival of the Queen of Sheba"
Coronation Anthems - the first being "Zadok the Priest"
Several Suites for Harpsichord - including No.5 whose final movement is an "Air and Variations" known as "The Harmonious Blacksmith"
Among the many CDs available of Handel's music, we suggest the following recordings. 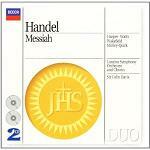 As alternative to the full version of Messiah, there are various CDs which include highlights from the work.